Day eight. Book eight. Jonathan Swift's ferocious satire, which argues babies should be sold as meat to end the Irish famine, can make adland think about how it responds to its own inconvenient truths. I hope the Bank Holiday has steeled you. 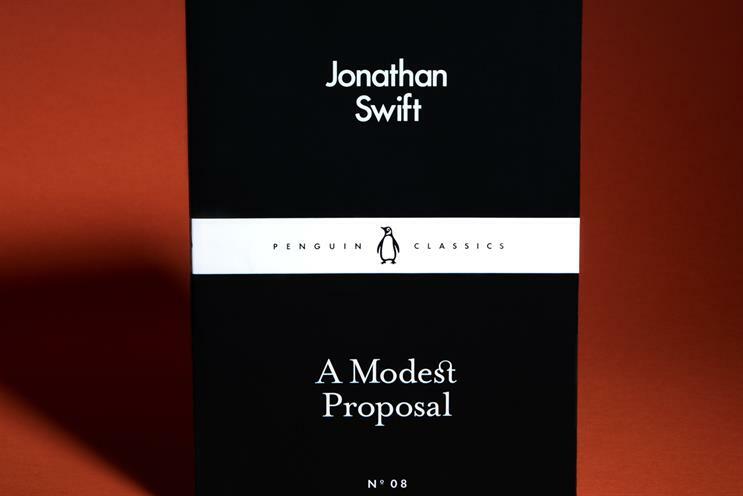 Jonathan Swift’s ‘A Modest Proposal’ is a "ferocious, landmark 18th century political satire on how to solve a famine in Ireland." Considered the best prose example of sustained irony in the English language, this is an anonymous and abrasive Swift (more Juvenal than Horace, for those who enjoy such distinctions) exposing in one perfect rhetorical manoeuvre the extent of the crisis in Ireland, the absence of any humane and practicable solution, and the then fashionable leaning towards social engineering. The essence of the proposal is that, in order to prevent "the Children of poor People in Ireland, from being a Burden to their Parents or Country" babies should be breast-fed until plump and then sold as meat for the dinner tables of the gentry. It is an unthinkable and grotesque proposal made plausible by the rigorous economic calculations in which it is encased; by the practical completeness of the thinking; and by the compelling absence of viable alternative. Swift leaves no part of the industrial value chain unaccounted for, as he describes the way in which even the skin of a yearling baby might become a high society delicacy. He has thought of everything that the logical mind would require of such a proposal – its effects on demography; its implications for religious ethnicity; its ability to create and keep value within the Irish economy; the way in which the populations (both "breeder" and baby) might sensibly be segmented for the task; the projected split of baby consumption between Dublin and the countryside; opportunities for export; methods of cooking . . . even the social occasions on which roast baby might fashionably be served. Smuggled into the final paragraphs, disguised and italicized as the "other Expedients" that Swift wants to hear not a word about until his "solid and real" proposal has been considered, is a manifesto for a self-sufficient Ireland. We, too, need a new manifesto. The question Swift’s satire raises for us, trivial and overfed though we may be, is how we respond to our own inconvenient truths. The ever declining margins; the migration of value; the temptation to socially engineer ourselves to success . . .Messieurs Knox and Murphy, brilliant men both of them, should read this book before leading the industry back to greatness, so that we can continue to inhabit our own unique state of sustained irony for many happy decades to come.